Gifted and Dynamic Public Speaker, with a gift of Servant Leadership. Engineer by degree, Leader by Destiny. My goal is to make people better so that they lead a successful life and career. You are here: Home » Are You Doing Enough? Mind if I use that? Man, I remember when I could do a lot of these. Don’t worry about how many you can do, just keep trying and take your time. Just attempting gives you a workout. Thank you. I have not done any since my surgery. While he was saying this, he reaches down, pulls up his right pants leg, and revealed a prosthetic leg from the knee down. I didn’t show it on my face, but inside I was dumbfounded. This man, older man, just jumped rope with one good leg. I started questioning myself if I would have done that given that situation. Sometimes we let our situation dictate our behavior. But, our behavior should dictate our situation. This will then affect the outcome. 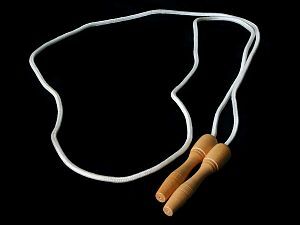 If he had chose to not jump rope, he would have never known he could have done it.